Dial Books for Young Readers, 2007. 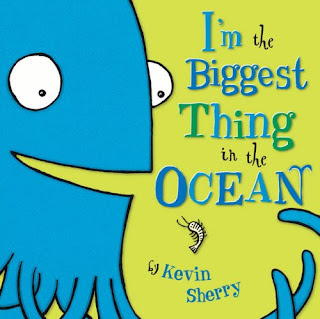 The giant squid is delighted to inform readers that he is "biggest thing in the ocean." He is bigger than the shrimp, the clams, a crab, and a jellyfish. He continues on comparing himself to various other ocean-dwelling creatures until he comes up against something that causes him to change his statement, but only slightly. This book presents itself as a great read-a-loud. The kids can guess at the upcoming animals as they get bigger. The illustrations are bright and colorful and not too busy, perfect for kindergartners or 1st graders. The surprise ending may even elicit gasps of surprise or giggles. 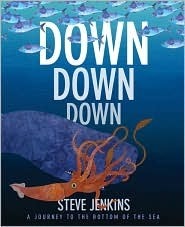 This book goes perfectly with Steve Jenkin's Down, Down, Down: A Journey to the Bottom of the Sea. Houghton Mifflin Books for Children, 2009. Jenkins delights the eyes with his beautiful cut paper collage as he introduces the reader to some of the creatures that live in the ocean. While Sherry follows a pattern of size, Jenkins uses a pattern of depth. He starts with creatures that live on the surface of the ocean including the Portuguese Man-of-War (jellyfish) and an albatross (sea bird). Next he presents creatures who live under the surface but routinely leap from the water including favorites like the great white shark and dolphins. He continues the pattern as he goes deeper into the ocean and the creatures get stranger and stranger. Each page contains a brief description of the animals presented with additional information available in the end notes. A great presentation from a very talented illustrator. Put these books together for a 'swimming' story time. I plan to use them with my first graders. I expect they will have much to say about both of these books and I would be surprised if I didn't have check out requests afterwords. Ants in large numbers help keep ecosystems healthy. They are also fascinating insects in their own right. Millions of ants live around the world. They live underground, in trees, inside thorns, or in nests they build themselves. Each colony usually has a single queen with thousands of workers (always female) to gather food and take care of the larvae and pupae. Ants also provide food for other animals and aerate the earth aiding plant growth. Some ants even grow wings that allow them to fly off to start new colonies. Being a National Geographic book, the photographs in this book are gorgeous and very informative. 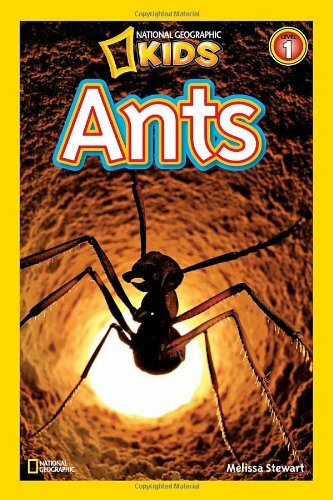 They show ants gathering food, traveling through tunnels, and taking care of the young. The writing is appropriate for new readers with vocabulary words defined in the text in addition to the glossary at the end. The definitions in the glossary also have pictures to aid in understanding, which is a nice feature. The occasional joke adds some humor. The attractive layout makes the book easy to follow. Head on over to Rasco from RIF for more Nonfiction Monday picks. 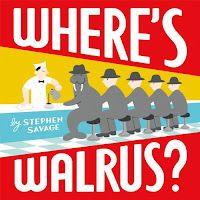 Walrus is bored at the zoo in which he lives and sneaks out to find some excitement. The zookeeper pursues him from place to place. Walrus disguises himself as he moves from fountain to diner to storefront window to construction site and several other places before ending up at a diving competition. The zookeeper finally lures the walrus back by providing a pool with a diving board allowing him to showcase his prowess. I shared this book with my kindergartners today and they enjoyed it immensely. I had several requests afterwords by students who wanted to check it out. The book is wordless, telling the story completely through the illustrations and the children got a big kick out of helping me make up the story to go with the pictures. The book also provides a great opportunity to discuss how illustrators use different art techniques to focus the readers attention. Savage does a great job of using color, diagonal lines, white space, and shapes to guide the reader's eyes where he wishes them to go. This book is a delightful read-a-loud and I recommend it highly. Maurice Reidy, known as Fish to his family and friends, has a natural affinity for the water. Unfortunately, this skill does not aide his family in working the family farm. When things become desperate, Fish goes to work with his uncle in the city to earn money to help his family. Things change dramatically, when Fish is given a mysterious pouch to deliver. Fish is waylaid before he can deliver the pouch and finds himself desperately trying to get the pouch back. He swims out to the ship where the thief has gone and inadvertently finds himself setting sail with a group of pirates. Leaving behind everything he knows, Fish joins the captain in searching for a mysterious treasure, wrestling with his own conscious, and trying to prevent a mutiny. What I find most interesting about this book is the fact that Fish has a conscience and quite a strong sense of right and wrong. When he first finds himself on the pirate ship, he tries really hard to get the pouch back so he can complete the task he was assigned by his uncle. This task proves impossible and he struggles with what joining the pirate crew requires of him. He manages to hold onto to his honor and his life, despite a strong dislike of fighting. Like many pirate books, treasure is at the heart of this story, but not just the monetary kind. The writing is descriptive and pleasant and there is plenty of action. Recommended. Felicity Bathburn Budwig arrives at her father's family home in Maine in the fall of 1940 only to discover that there is tension between her father and his family. She determines not to be influenced by this strange new family, including her Uncle Gideon, Auntie Miami, and The Gram. But as she gets to know them, she realizes that there is more to her family than she ever imagined. The situation gets more complex when she discovers Derek, an adopted boy, who is recovering from polio. When her Uncle Gideon starts receiving letters from Portugal that she is positive come from her parents, who are supposed to be in London. But he won't let her read them. The mystery grows when she and Derek discover that the letters are written in code. She is determined to discover what the letters mean and why her new found family harbors bad feelings toward her parents, Danny and Winnie. The book is well-written and does a nice job of creating a rather unique setting. I could picture the house on a bluff overlooking the ocean. I could almost smell the ocean breeze. However, I did have a problem with some of the story elements. First, the plot is not very compelling, I had to push myself to finish the book. Although there are a couple of interesting plot twists that help keep the plot going, I'm not sure most kids would bother finishing the book. Second, while the characters are unique enough to be diverting, I didn't really come to care about them a great deal. I only vaguely cared about what happened to them. The book is an interesting read, but not the kind of book that pulls you in. An additional note, I have a problem with the cover. As has already been discussed on other blogs, the cover is very misleading. First, the shoes highlighted on the cover do not come from the time period the story takes place in. Second, the relationship of Felicity and Derek is a subplot, not really a main part of the story. For additional thoughts on the book check here and here. Today being President's Day, it seems appropriate to highlight some books that revolve around the founding of our country. I have read a lot of books about the American Revolution, but none quite like the ones that I am highlighting today. Generally speaking, most books about the American Revolution focus on the patriots, the white patriots. But like all historical events the reality was much more complex. These books help present that complexity. Atheneum Books for Young Readers, 2008. Isabel and her sister, Ruth, having lost both their mother and their owner, expect to be freed as their owner promised them they would be. Unfortunately, Mr. Robert does not free them, instead he sells them to a British Loyalist and his demanding wife. After arriving in New York, Isabel meets a slave boy by the name of Curzon, who encourages her to spy on her owners to help the patriot cause. Isabel does so believing that it will help her obtain her and her sister's freedom. But Ruth's ongoing health problems (seizures) cause Isabel great concern and result in Ruth being sent away. Isabel, a very spirited girl, nearly attacks her mistress, and ends up being severely punished. Isabel feeling betrayed by Curzon and the patriots maintains a submissive demeanor for a time, until she realizes that her only hope for ever seeing her sister again requires that she act. Anderson does a great job of introducing the reader to characters that are both sympathetic and intriguing. The ongoing conflict between Isabel and her mistress provide tension throughout the book. The details presented about the time and place give a vivid picture of life for slaves at that time. The tremendous irony of the patriots fighting for their freedom while supporting slavery gives a heart-wrenching, thought-provoking aspect to the story that will not be quickly forgotten. Forge, the follow-up to Chains, continues the adventures of Isabel and her friend Curzon. Chains was told from Isabel's point of view, Forge is told from Curzon's point of view, which presents us with a different picture. After rescuing, Curzon from prison (he was a prisoner of war), Isabel becomes frustrated with Curzon's unwillingness to search for her sister and takes off on her own. The story follows Curzon into the heart of the American Revolution. Curzon ends up at Valley Forge, struggling to survive the brutal winter. Unfortunately, Curzon is spotted by his 'owner'. Curzon considers himself free because his owner promised him freedom if Curzon would take his place in the American army. His owner, however, has no intention of keeping this promise and Curzon ends up serving as a slave once again. To his shock, he discovers Isabel also serving Bellingham as a slave. Determined to escape, Curzon tries to enlist Isabel in his plotting, but to his shock she refuses. When he realizes why, Curzon becomes even more determined to find a way for them to become free. 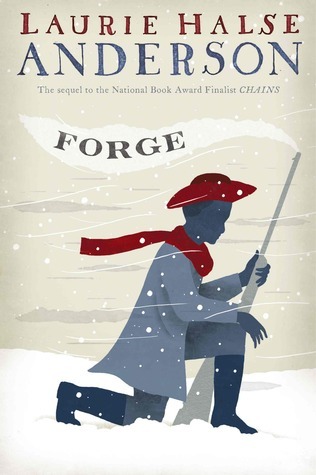 Again, Anderson provides a fascinating glimpse into the lives of both patriots and slaves. She deftly integrates history into the story of Isabel and Curzon and gives the reader mixed emotions about the contradictions in American history. The quotes at the beginning of each chapter do a nice job of foreshadowing the coming events. The writing is clear and crisp and keeps the reader's focus on the story rather than the words used to tell it. Liberty or Death presents a nonfiction complement to Anderson's books. Blair explains why many slaves served the British during the American Revolution and what they hoped to get out of it: Freedom. Some slaves did serve with the patriots for the same reason. Unfortunately, few slaves actually received freedom. The British encouraged slaves to run away from their masters, but only patriot masters, slaves belonging to loyalists were returned. Once the British lost the war, slaves living in New York were given a chance to prove that they should be free and given the opportunity to leave American shores, but many slaves outside of New York, remained in slavery. Even those who received freedom, were not given equal treatment. For example, some black loyalists moved north to Canada, but few received the land they had been promised. The narrative is clear and easy to follow. The illustrations provide a nice touch and give the reader a glimpse into the experiences of slaves during the time period. The organization of the book helps the reader understand what happened to the slaves both during and after the American Revolution. These three books would be great to use in an American History class, they provide a glimpse into a side of the American Revolution that is often neglected. I also recommend these books for those looking for interesting, thought-provoking stories. On Fantastic Fridays, I will be highlighting books that I have shared with my students, that they seem to particularly enjoy. I will also be highlighting books that I have personally really enjoyed. 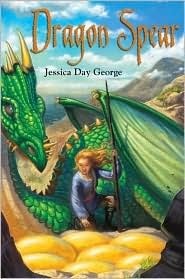 Today, I will be writing about a trilogy by Jessica Day George. After being sent by her aunt to a dragon's cave to wait for the local squire's son to rescue her, Creel decides that it is time for her to set out on her own. She makes a bargain with the dragon. If he will let her take something from his treasure, she will get rid of the knight that the dragon doesn't want to fight. To her surprise, she discovers the dragon's treasure consists of shoes, but after choosing a beautiful pair of blue slippers, Creel keeps her bargain. She sends the knight on his way and sets off for the King's Seat to find work as a seamstress. Along the way she finds herself set upon by bandits and rescued by a golden dragon named Shardas. She stays for some time with Shardas becoming good friends with the dragon. She finally sets off for the capital city only to immediately antagonize the Roulain princess who will be marrying her country's prince in order to cement a treaty between the two countries. Creel finally finds work as a seamstress and settles into her new life with the help of a fellow seamstress named Marta. But after meeting and befriending the younger prince, Luka, she discovers that her blue slippers have great power. Unfortunately, she does not find this out until they have been stolen. With the help of Luka and Marta, Creel must find a way to prevent the slippers from being used to destroy not only the capital city, but the Shardas as well. This book provides not only a delightfully new plot, but characters that the reader can connect with right away. The friendship between Creel and Shardas is especially interesting as two must reach across their own cultural restrictions in order to do so. The writing is clear and crisp and the reader immediately becomes immersed in this new and entertaining world. The plot moves along with plenty of humor and spirit and even a little romance. A fun read for both boys and girls. The two sequels, Dragon Flight and Dragon Spear provide additional time with Creel and Luka and their friends. 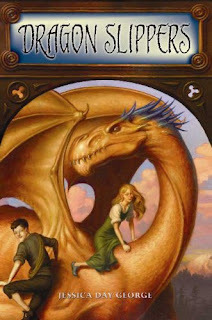 In Dragon Flight, Creel and Luka are sent to investigate rumors of a dragon army preparing to invade their homeland. In Dragon Spear, Creel, in the midst of wedding preparations, must rush to the aide of her beloved Shardas, after his wife, Velika is kidnapped (dragonnapped?). Both books provide the same delightful storytelling and character development as the first. I highly recommend this series for anyone who loves fantasy. Sebby and his twin sister, Barbie, live with their parents on one of the few remaining properties that have not been claimed by Mr. Odum's mining company. Sebby's father grew up with Mr. Odum and thinks well of him. Sebby is not so sure. When strange things start happening involving disappearing chickens, flashing colors, mysterious caves, and strange phone calls from his runaway brother, Jed, Sebby is sure that Mr. Odum is involved and it all seems to revolve around Sebby's secret place known only as the hole in the wall and a strange substance he and his sister discover. Sebby and Barbie must work fast if they hope to save their family and their home. The characters brought to life so vividly are the best part of this book. The story is told from Sebby's point of view and his opinions on his life and the world around him are very clear. The strained relationships within his family is shown through their interactions rather than told. The writing is solid and doesn't interfere with the storytelling. The idea of a mineral like substance that is drawn back to itself and can invade the human body and even petrify it is a bit strange, but acceptable. The theme of family pulling together for the good of the whole is clear throughout the book. Overall, an interesting read that raises lots of questions about the ethics of what we do to the earth when we access her resources. Ragdoll cats earned their name from the way they relax and hang like a 'ragdoll' when they are picked up. They are also soft and warm, and the perfect cat to cuddle with. But like all cat breeds they are not for everyone as Landau smartly points out. With gorgeous blue eyes and bushy tails, ragdolls can make themselves at home almost anywhere. Because of their friendliness and the high maintenance care they require however, they make better indoor cats than outdoor. Landau does a great job of presenting a good overview of this cat breed. The writing is clear and easy to follow. The author provides just enough information with becoming heavy handed. She covers all of the major points, history of the breed, characteristics, how to chose a cat, and the kind of care required. The layout is outstanding and very attractive. Children are likely to pick up this book just because of the beautiful cat on the cover, as well as the bright colors which catch the eye. Definitely a book to put in the hands of the youngest cat lovers. Check here for another review. Today I am sharing three books that offer a variety of interesting topics and story lines, including traveling around the world by car, delightful pets, and minerals that can cause petrification. Jules Verne's Around the World in 80 Days is considered a classic adventure tale. This book revolves around the experiences of an Englishman named Phileas Fogg and his servant, Passeportout traveling around the world by boat, train, and any other form of transportation they could find. This new book surrounds the exploits of Phileas Fogg's son, Harry, who has inherited his father's pride leading him to make a wager similar to his fathers. 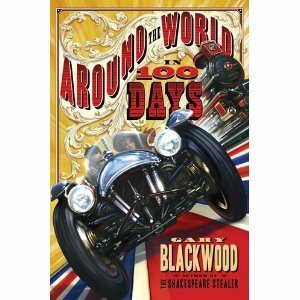 He must travel around the world by car in 100 days. Harry and his friend, Johnny, have built what they believe to be the ultimate motorcar. Now, Harry and Johnny have the opportunity to test this belief, but there is more at risk than money. In order to get the money to pay for the trip, Harry has promised that if he loses he will buckle down and choose a profession, something he has avoided strenuously. With the addition of two companions, Harry and Johnny are on their way. Charles, the son of the man with whom Harry made his wager, comes along as 'rules enforcer' and Elizabeth, a journalist, to document the trip. But the plucky group quickly run into all sorts of delays and expenses, including races, wildfires, and possible sabotage. But Harry, like his father, is to determined to give up, even if it means risking the things most precious to him. This book doesn't quite live up to its predecessor but provides quite a fun trip nonetheless. Harry is a likable, if rather reckless fellow, and Johnny with his vulnerabilities, embraces the readers empathy. The adventures the group encounters move the story along quite well. There are just enough twists and turns to keep the pages turning. And the reader catches a glimpse of the world as it was in 1891 with plenty of bumpy roads. 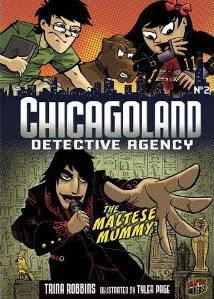 Megan, Raf, and Raf's talking dog, Bradley, run the Chicagoland Detective Agency. But Megan is more focused on a chance to meet her favorite musician, Sun D'Arc. While Raf is stuck at home sick, Megan recruits another friend, William to go with her. Unfortunately, on the way home from what turned out to be a very short interview, William disappears. It is up to Megan and Bradley to find out what has happened to William and how it is connected to the disappearance of a valuable Egyptian artifact. Like many graphic novels, this one starts right in on the plot. The book is rather lacking in character development, a common flaw in many graphic novels, but reluctant readers won't care. The fast plot, interesting characters, and entertaining artwork are bound to win over even the most reluctant of readers. This is one I plan to add to my library's collection. Here is my first post on a Monday. I have a couple of good books to share that complement each other nicely. The common denominator is Afghanistan, a relevant topic these days. Abby Carson has perfected the art of homework avoidance. It's not that she can't do it, she just finds other things more enticing. She discovers to her shock, however, that unless she can make up some of the missing work, she will be held back a year. Abby finds herself working on a project involving a pen pal from Afghanistan. Sadeed loves his schoolwork and is the best student in his class, but he cannot correspond with Abby directly, because she is a girl. His younger sister is given the task of corresponding with Abby, but Sadeed finds himself intrigued with the American girl and starts writing to her himself. Both students find themselves fascinated by the experiences of the other. They soon discover that not all people are willing and able to be so open and accepting. This book provides a glimpse of a lifestyle and culture very different from that of many children in the United States. Clements does a good job of giving the reader characters to root for and an opportunity to realize that people from other cultures can connect with each other if they are willing to try. The blurb from the book says, "Award-winning photojournalist Tony O'Brien and filmmaker Mike Sullivan went to Afghanistan to interview and photograph children of all ages and ethnic backgrounds, and with very different daily lives. As each one tells his or her story, the reader is placed in the middle of everyday life as it is lived by the children of one of the world's most enduringly conflict-ridden countries." Children from Afghanistan have many of the same dreams that children from the United States have, but they also deal with severe struggles. This book opens a window to give a glimpse of some of these dreams and struggles. Examples include Wahaab, age 10, and Shaheen, age 10, who turned to thievery hoping to earn enough to help provide for their families and now find themselves facing the prospect of jail. Then there is Nasi, who sells plastic boxes in the morning and studies music and math in the afternoons, who hopes to become a teacher. It's difficult to read this book without wanting to help. Pennies for Peace offers a way for us, who have so much, to help those who have so little, but who dream so big. This is my first post on my new blog. I am both excited and nervous, excited because I love talking about childrens books, and nervous because these words will be out there and available for anyone to see. The name of my blog comes from the fact that my undergraduate degree was in geography education and my graduate degree was school library services. I currently work as a elementary school librarian, which I love. But my love for learning more about the world around me has never left. This blog gives me an opportunity to share both my love for books and reading and my love for the fascinating world around us. This blog is still under construction, so I hope you will be patient as I try to put it together in a pleasing way. Since the bulk of the posts on this blog will be about books, I will go ahead and share my first blog review. Alfred A. Knopf Books for Young Readers, April 2011. 432 pages. Reviewed from ARC received from publisher. The title of this book caught my attention from the beginning. 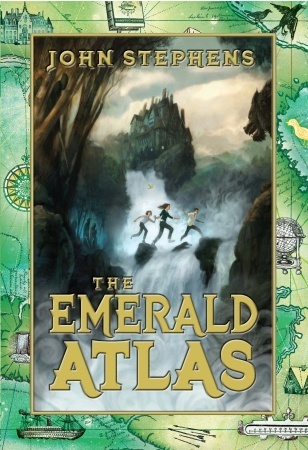 The idea of an enchanted atlas sounded very interesting. The book did not disappoint. Kate, Michael, and Emma have spent their lives being shifted from orphanage to orphanage. They have very little to remind them of their parents, not even a last name. Kate vaguely recalls her mother kissing her goodnight and promising that they would be together again. Michael recalls only a little and Emma recalls nothing. Everything changes the day the three children are moved to an old collapsing mansion by a lake near an abandoned town. While there, they discover the a realm of magic and the power of space and time contained in the atlas. After inadvertently traveling back in time, the three children witness a sorceress holding the town's children hostage, forcing the townspeople to search for the atlas, supposedly buried under a local mountain. When the sorceress spots the children, the frantically open the atlas to return to their own time. In the process, Michael gets left behind. Now Kate and Emma have to find a way to rescue their brother, while avoiding the evil plans of the sorceress. With the help of a magician and some friendly (and not so friendly) dwarfs, the children face the destiny before them. This book is strong in every way. For me, the mark of a well-written book is it's ability to get the reader so focused on the story, that the reader doesn't even notice the writing. This book has that kind of writing. 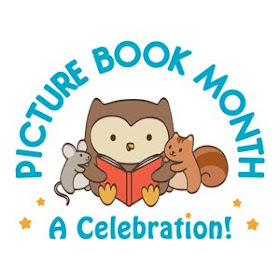 The story moves along quickly, providing the kind of plot momentum that so many children today crave, which is important because of the length of the book. The plot twists and turns make it difficult for the reader to predict where the story ends up. The setting becomes so real, the reader can almost feel it around them. However, please keep in mind, the book is very detailed and not every reader likes this amount of detail. Character development is also a big part of the story, which I like in the books I read. Kate, Michael, and Emma all struggle with weaknesses and fears brought on by the seeming abandonment of their parents. All in all I highly recommend this book and willingly add it to my shelf of favorites. The only real problem I had with this book, is knowing that I'll have to wait for the sequels.